ApePlanet wrote: I got a Wyze Cam today. Excited to see how it holds up. I’m still concerned about the moisture and humidity but for $25 it’s worth a shot. I know! Isn't it great?? I love my cameras. Opens a whole new world of crabbing. How did you set yours up? It really does! I used the adhesive that was included to mount the magnet in the front-right corner of the tank. Huh. I rigged up an elaborate set up. Maybe I shoild just use what it came with. Lol. Hermiesguardian wrote: I know! Isn't it great?? I love my cameras. Opens a whole new world of crabbing. How did you set yours up? Yeah I just used what it came with to start. 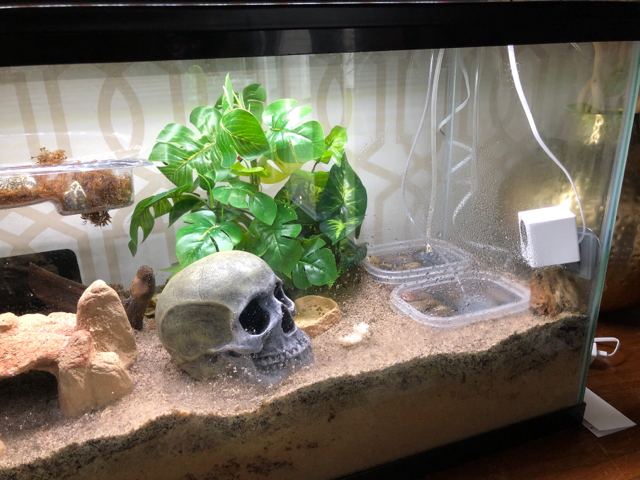 @Hermiesguardian any suggestions for placement in the tank? I see yours is higher up. I have a 20 gallon now and mounted it near the surface and the pools and that's going to be a problem. I think yours is near a pool as well, but do you have bubblers in your pools? That seems to be the biggest problem for me... the water (saltwater especially) splashing on it. ApePlanet wrote: Yeah I just used what it came with to start. I do have bubblers but my camera is higher. And my bubblers are peobably set on medium snyway. I didn't want the crabs crawling on it, that's why I put it high, not next to anything the can use to get to it. Did you put it an sd card? Not yet. I ordered one from Amazon last night. My bubblers are on low myself but they still spit pretty good. I just looked at one of your vids again and it looks like your camera is right on top of a pool. It’s just baffling how the bubbler doesn’t spit on your cam. It's a few inches above the pool. I have my first timelapse recording! I moved the cam to the other side of the tank away from their pools so they wouldn't spit on the lens. This is so cool! 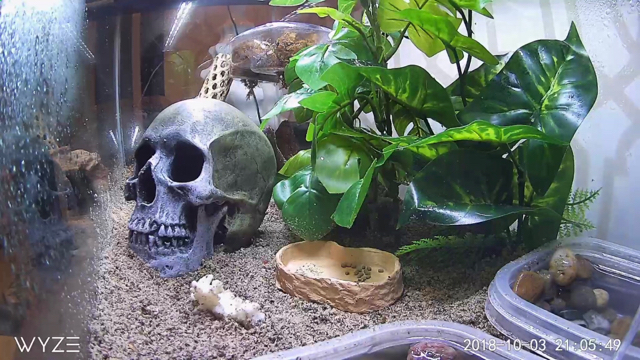 My bigger one goes out of his cave to chow down for a while with his buddy, then buries himself at the end! 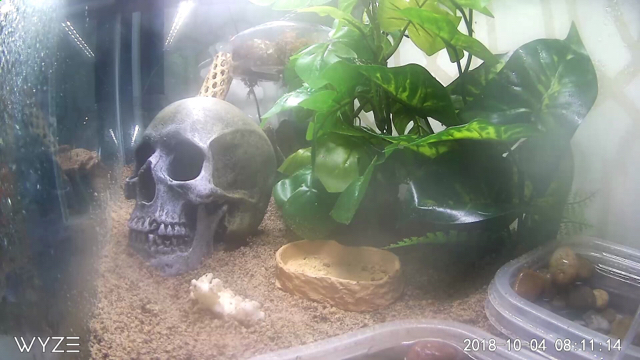 ApePlanet wrote: I have my first timelapse recording! 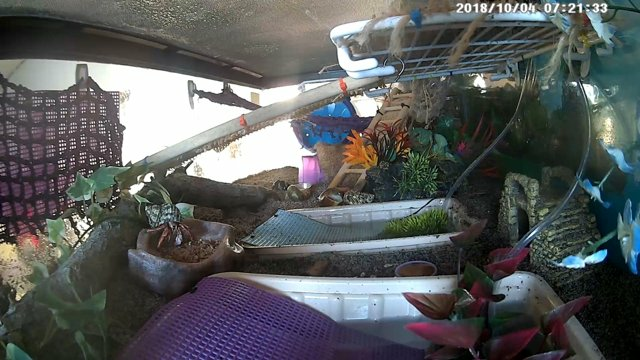 I moved the cam to the other side of the tank away from their pools so they wouldn't spit on the lens. This is so cool! My bigger one goes out of his cave to chow down for a while with his buddy, then buries himself at the end! Time lapse is so cool! I never watch mine like that. Very nice video! It was so cool to watch him dig down. 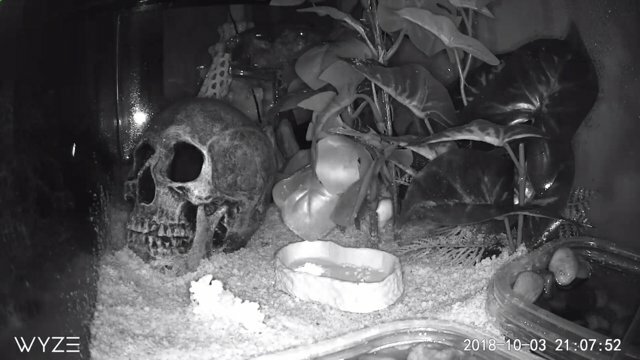 Very cool , what is The plastic bin that the crab crawled up to that looked like it was filled with either Moss or straw of some type? jstein wrote: Very cool , what is The plastic bin that the crab crawled up to that looked like it was filled with either Moss or straw of some type? Thanks! It’s a clear plastic shower caddy hung using Command hooks. And it’s moss in it. HOLY COW! That view is incredible!!! I can't wait to get some!! Is this the same one everyone has? Does it need a microSD card to work? I want to make sure I’m getting the right one. When I looked before I thought it was different but I could be wrong.